Home / Relationship / spirituality / What is an Empath? Empathy is the ability to imagine “What’s it like to BE them”? A person in the level of ego feels sympathy for others. When he sees someone in emotional distress, he may or may not recognize the pain as something he has experienced before. If he doesn’t recognize the pain, he may judge it and say the person is “faking it”, “making it up”, “just trying to get attention”, or some other dismissing statement. If he does recognize the pain as something he has experienced before, it may frighten him. He does not want to re-experience that pain again. There is a small thought which is buried deep within that says, “I’m grateful it’s him and not me.” Sympathy is a mixture of sadness for the self with sadness for the other. He only partially connects to the other person, because the goal is to keep some distance between his brother’s pain and himself. Sympathy is self-protection veiled in caring. It LOOKS AS IF the focus is on caring for another person, but in truth, sympathy is focused on the needs of the self. A person in the level of the heart feels empathy for others. Whether or not he has ever experienced the exact nature of his brother’s pain is irrelevant to his ability to recognize it and rise to meet it. He is able to put himself in the other person’s shoes. The person capable of empathy isn’t concerned with the self, but is concerned with the experience of the other. He isn’t afraid to feel his own pain, and therefore, isn’t afraid to the feel someone else’s. 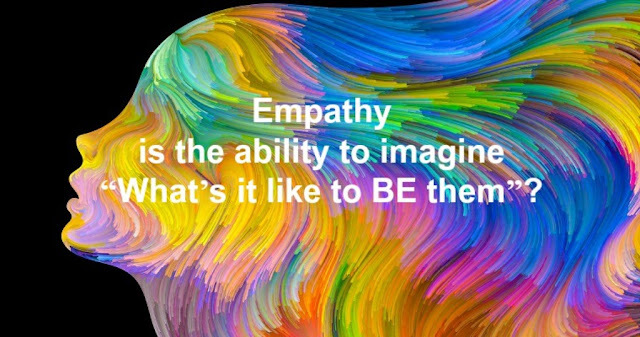 The goal of empathy is to see, feel and know the other person’s experience, independent of his own. A person who lives in the level of the Heart (4th Density Consciousness) is capable of love as empathy. At this station of spiritual evolution, he is able to see that others are equal to himself in every way. He sees that their feelings are just as valid as his are (no matter what their feelings happen to be). He sees that their perceptions are equally valid (even if they differ from his own). He sees that their needs are equally important to his. He understands that no one is right and no one is wrong. He understands that human suffering deserves compassion no matter the reasons, causes, or conditions. Being an empath should be seen as a leap in the soul’s evolutionary consciousness. The difference between a person who lives in the station of ego, versus a person who lives in the station of Love is a QUALITATIVE shift in insight. Empaths generally have their own unique set of challenges. Because they are unafraid to feel human suffering, they sense it EVERYWHERE. Think of an empath as a super-tuned antenna which picks up thousands of radio frequencies day and night. An empath faces the task of learning – not how to be more tuned in – but how to filter the signals he receives. He must learn discernment if he is to retain his own sanity. Since empaths feel the suffering of others, they usually have a strong desire to help. Some empaths develop a desire to take away the suffering of others. It’s vital to take the middle road with this as we step into healership. You may have heard of a little something called Free Will. Free Will is the first, and most important law of the universe. It means that each individual has a RIGHT to learn and grow at his own pace, and in his own way. It is each person’s right to learn his own lessons… and the way humans learn is through pain. It would be an infraction of the law of Free Will for a healer to attempt to take something out of a person. Empaths have the ability to understand, and to guide a person toward a better place… but they do not have permission to remove or absorb someone else’s suffering. Even if it were permissible for empaths to take someone’s suffering from them, it’s not actually POSSIBLE. Have you ever had a healing session where the healer waved their hands and magically “removed” a darkness from your being? You may have been told you were healed. Be honest here – did the issue return? I’ll put my money is on the fact that it did. The reason why is that we cannot escape our own karmic learning. It is not possible to take away someone’s process of struggling through their lessons. Humans either do their work to learn the lesson, or they stay in pain. There’s no other way out. When an empath attempts to absorb or process someone else’s pain through their own being, it can injure the helper. Opening one’s field to take on the energy of another can drain one’s vital energy and damage the energy body. We have to maintain great care for ourselves if we are to have any chance of helping the world. The point isn’t to try to fix the suffering of others. It’s simply to BE WITH THEM in their distress and to point toward a healthier way. Empathy in the level of the Heart (4th Density) is a sign of spiritual maturity. Empathy means that we realize we are all equally important. Your pain. My pain. Their pain. We all matter the same. Go forth and love your hearts out!